You are a Sagittarius if you were born between November 22nd through December 21st. The Sagittarius man personality is likely to take opportunities to study abroad or help out in the peace corps for the traveling and of course, all of the knowledge that comes with it. By traveling the Sagittarius man knows that he can learn practical and interesting things in an out-of-the-box kind of way. This is the Sagittarian’s favorite way to learn, and he will never pass up an opportunity to travel. The Sagittarius man traits show that he is a socialite. He loves to get to know other people. He sees this as another way to learn about all the things around him. He is likely to have a variety of different friends from all sorts of social and cultural backgrounds. He thinks that this will keep him more educated about the world around him, and it often does. The Sagittarius man characteristics show that because he has so many friends he is not likely to know any of them very well. He, like any other zodiac sign, will have a group of close friends, but he will also have a large circle of acquaintances who he only talks to from time to time. The Sagittarius male is simply so good at making friends that it is hard to keep track of all of them at times; at least, it is hard to divide up his time between all of them. This can lead some of his friends to feel neglected at times. The Sagittarius guy is an optimist. He loves the world and everything in it. If something doesn’t go his way, he knows that he’ll still be able to survive without more than a scrape or a bruise. The Sagittarius man personality traits show that he can easily adjust to his environment and situation, which makes him an ideal traveler and socialite. His friendly and happy disposition leads him to plenty of new opportunities than some of the other star signs. Sagittarius men are generally regarded as one of the luckier sun signs as well. The Sagittarius man characteristics show he does not want to be stuck in one place for his whole life. The Sagittarius man craves to obtain as much knowledge about diverse things as he can during his lifetime. However, he won’t want to learn in a boring traditional classroom. The Sagittarius man wants to learn all that he can be experiencing the world. He is likely to daydream about travel during his youth, and then pursue it once he has the money to do so. The Sagittarius man personality wants to learn as much as he can, and because of this he is extremely likely to become distracted easily. He wants to learn so much, but he has so little time to do so. He will switch back and forth between topics and just what he is generally interested in often. This may make the Sagittarius man seem indecisive or disoriented to the other zodiac signs, but he knows that his is the best way for himself to gain as much knowledge as he can in a little amount of time. It is more likely that the Sagittarius man will learn a little bit about a vast array of topics, rather than a lot about a few topics. The Sagittarius man has no qualms about learning like this, and he wouldn’t change his learning style even if he knew a better way. The Sagittarius man traits show he is open-minded when it comes to what kind of partners he is interested. He is likely to flirt with many people and have a few casual hookups before he actually finds someone who he will fall in love with. He will want to spend much of the relationship learning from his partner, trying new things, and staying in bed. 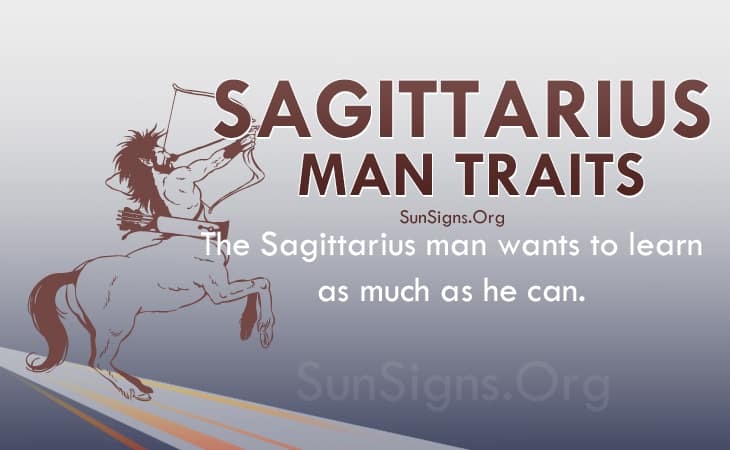 The Sagittarius man personality traits show that in the end, no matter how many partners the Archer man tries, he will not find a successful relationship until he finds a partner that is as optimistic about the world as he is. Once he finds this partner, the two should have a happy relationship for years to come.